Secretaries of all Affiliated Units. 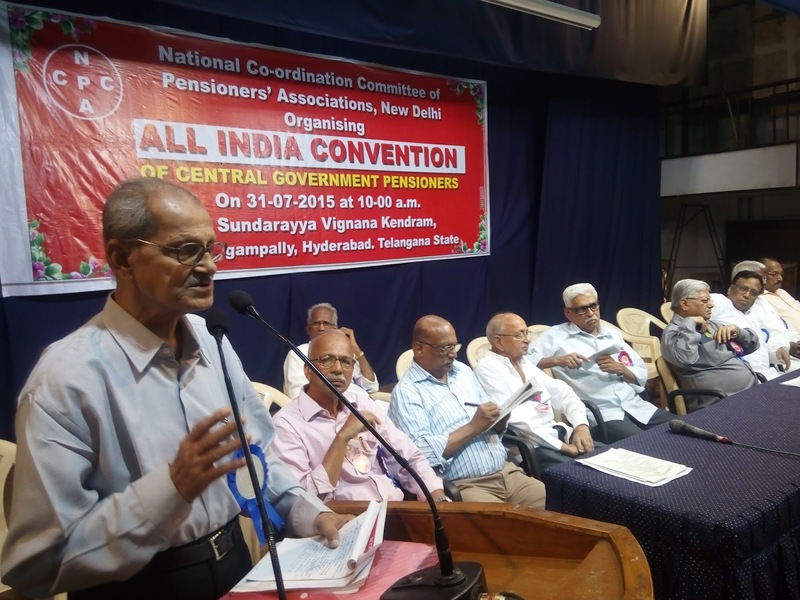 CHQ congratulates the affiliated units of NCCPA and the pensioners of all other organizations for participating in large number in the Hyderabad convention organized by NCCPA to make it a grand success. 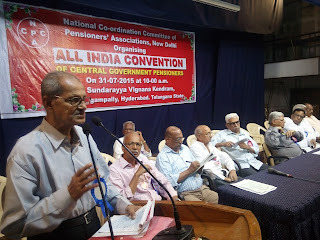 Our thanks are also due to the host Branch, Telangana State All Pensioners’ and Retired Persons Association for arranging the convention in a befitting manner. National leaders of the trade unions in different fronts viz. Central Trade Union, Railway and Defense Employees Federations and confederation of Central Govt. 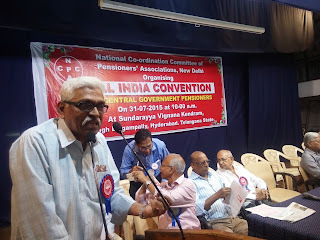 employees enlightened the delegates on the attacks of neo-liberal economic policies in every walk of life of the common people including pensioners and stressed upon the need to organize effective movement by the pensioners of all sectors unitedly along with working people to defend the interest of the pensioners. An approved declaration is circulated separately. Solidarity Programme in support of 2nd September, 2015 strike by the Central Trade Unions and Central Govt. employees strike from 23-11-2015. 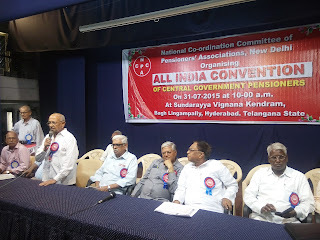 Declaration approved by the convention of All Pensioners Organisations unanimously decided to extend total solidarity to 2nd September’15 strike by organizing Dharna/Demonstration etc. Organizing Dharna or holding Demonstration on the strike day may not be uniformly possible for all the States because of suspension of vehicular traffic on account of general strike. So, it may be planned according to local situation and campaign programme may be undertaken on earlier days in support of the strike. As regards proposed indefinite strike by the Central Govt. 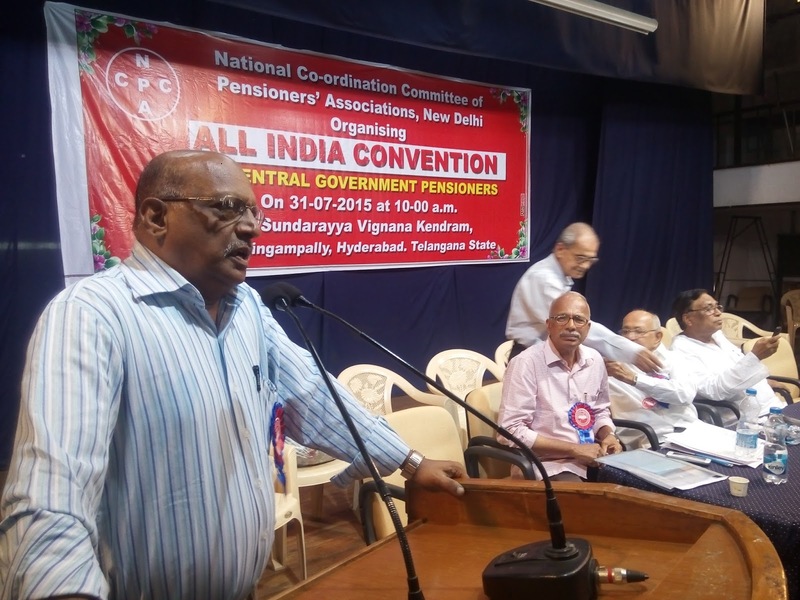 employees from 23-11-2015, pensioners may jointly with State Co-ord. Committees of Central Govt. Employees or separately hold demonstration or sit on Dharna. Branches may communicate the nature of programme undertaken by them. All India Conference : Third Triennial Conference of the NCCPA is to be hosted by the Co-ordination Committee of Central Govt. 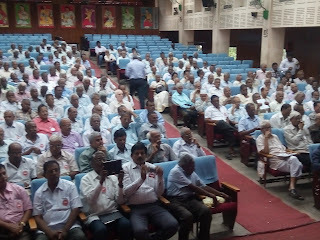 Pensioners’ Associations, West Bengal. A strong Reception Committee has already been formed and the Committee has also started functioning. Venue of the conference and accommodation for delegates has already been booked. Conference will be on 6th & 7th of November, 2015 and preceded by an Executive Committee meeting on 5-11-15. Accommodation for delegates has been booked for three days i.e. 5th, 6th and 7th. Bulletin from the Reception Committee is under issue. Affiliates may book their Railway reservation accordingly. In my circular dated 15-06-2015, all the affiliates were requested to intimate NCCPA, CHQ at Kolkata Office (68B, Malanga Lane, Kolkata-700012) the amount of quota already remitted by them for the years 2011-12, 2012-13, 2013-14 and 2014-15 with receipt No. and date, so that the same could be verified with this office record. Barring a few, others have not yet furnished this information. Since strength of the delegates in the ensuing conference is to be determined on the basis of the quota received for the above years, the affiliates are requested to furnish this record immediately for their own interest. After long legal battle, Dept. of pension and Pensioners Welfare issued order on 30th July’15 granting fixation of pension in accordance with the original OM dated 01-09-2008 read with the fitment table annexed to the orders from 1-1-2006 instead of 24-9-2012. Full order will be published in The “NCCPA News Letter” August, 2015 issue. 78.2% IDA Merger : It is understood that Deptt. Of Expenditure has raised some objection on the Cabinet Note prepared by DOT. DOT is again re-submitting the file. DECLERATION Adopted by the All India Convention of Central Government Pensioners held on 31st July, 2015 at Hyderabad,Telengana State. 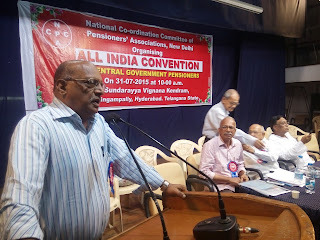 This All India Convention of Central Government, Postal, Railway, Defense, BSNL-DOT, EPF and Paramilitary Pensioners organized by NCCPA (National Coordination Committee of Pensioners Association) notes with deep concern, after observing the economic policy being pursued by the government of India for the last two decades or more, that unless a sustained long drawn programmatic action through mass participation is generated, continued long standing sufferings of the people including pensioners cannot be removed. 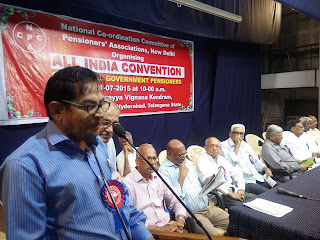 This convention notes with regret that in spite of Dharnas, Demonstrations, Parliament march, submission of memorandum to the Prime Minister including general strikes organized by Trade Unions and Confederation of Central government employees where pensioners also moved shoulder to shoulder with working people, both UPA and NDA governments remained un-responded. This convention is of the firm opinion that World Bank-IMF sponsored new economic policy, which was ushered in 1991 is the fountain source of continued miseries of the pensioners along with workers and employees. End results of Neo-liberal economic policies are (a) Increasing concentration of wealth in hands of the few (b) Withdrawal of state participation in economic activities (c) Job loss and declined in earnings (d) Relentless rise in prices, (e) Unbridled scam, scandal and corruption. Effect of the end results of the above economic policy is well manifested in every sphere of our social life. Prices of essential commodities to maintain the subsistence level of livelihood, reduction in social security measures, casualization and contractualization in appointment is ever-increasing. High inflation resulting on account of policy of liberalization has also hit the pensioners in a big way. By introducing New Pension Scheme and enacting PFRDA Act, 2013, the social security in old age has been demolished for those entering service on or after 1-1-2004. The sixth Central Pay Commission has recommended that merger of D.A./D.R. should not take place and has also discarded the principle of equalization of pension/parity in pension between past and future pensioners. Not only central government pensioners, pensioners of other sector like BSNL pensioners, EPF-95 pensioners, Ex-service men pensioners are also the victims of the severe economic offensive of the successive government. Erstwhile UPA government and the present NDA government have no different approach on policies and are jointly in the process of implementing economic reform measures. But for BJP’s support the PFRDA Act could not have been passed. Through various policy pronouncements, the new government has made its intentions clear. FDI has been allowed entry in Insurance (49%), Defense (26%-49%), Railways (100%) and in New Pension Scheme. It is not unlikely that the New Pension Scheme replaces all existing defined benefit dispensations / reduce the pension. Government has issued directives to NPPA (National Pharmaceutical Pricing Authority) to withdraw its circular, which capped the prices of several crucial drugs paving the way to hike the prices of those drugs. It appears that center point of all attacks on the common people is the government policy and only a concerted resistance movement can force the government to abandon those policies. Unions and associations of the Central Government Employees and workers under the National Council of Joint Consultative Machinery are agitating under JAC and having found an indifferent attitude of the government they have announced an indefinite Strike from 23-11-2015 in a massive march to Parliament on 28-04-2015. 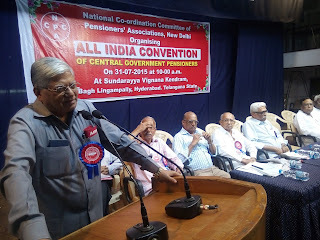 All the Central Trade Unions (including Bharatiya Mazdoor Sangh) are waging a bitter struggle including an All India Strike on 2-09-2015 against the Anti-Labor, Anti-Worker, Anti-People and pro Corporate policies of the government. 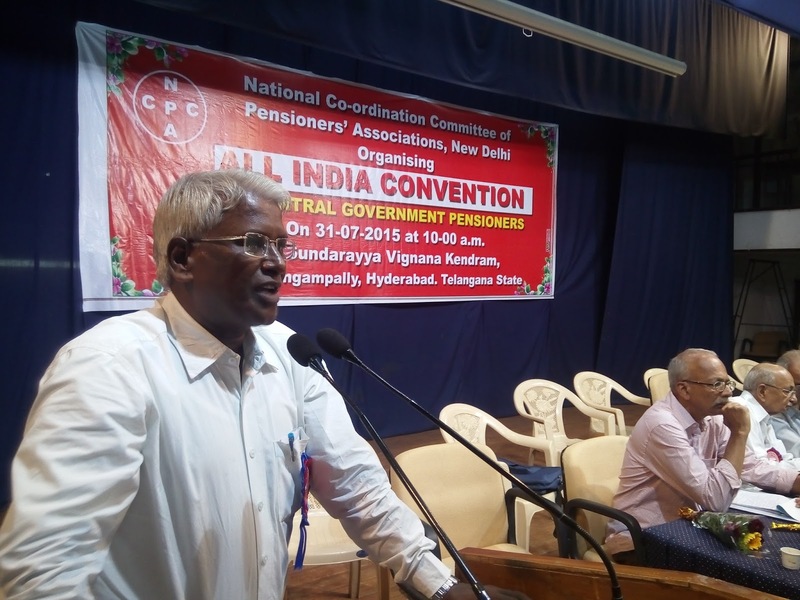 The Central Government Pensioners while agitating on their demands have also to extend unqualified support and solidarity to this struggles by organizing appropriate agitational programs. 1. That date of effect of pension revision by Seventh CPC is 1-1-2014. 2. That revision of pay and pension is done after every 5 years. 3. That merging DA/DR after every 50% rise of DA quantum. 4. That seventh CPC covers the most exploited segments of Civil Services namely viz. casual/contract workers and the G.D.S. 5. That the full parity in pension is granted to past pensioners as on 1-1-2014 and grant pensionary benefits to Para-military forces and pensioners on par with Armed personnel. 6. That PFRDA Act. may be repealed and defined benefit statutory pension scheme reintroduced for those who enter service on or after 1-1-2004 and their contribution be transferred to GPF. 7. Assure Defined Benefit pension system for all and bring pension system of all sectors under statutory pension scheme. 8. Grant of minimum pension on par with the basic pay of MTS under Central Government. 9. Hassle-free cashless medical treatment for all- ending the discrimination of P&T pensioners by permitting them to join CGHS scheme without any condition - and extension of CSMA rules, 1944 to pensioners drawing FMA. 10. Pension revision of BSNL pension should be made mandatory whenever wage revision is implemented in BSNL. 11. That SCOVA may be recognized and functions on the pattern of JCM and Compulsory Arbitration Schemes and frame rules for recognition of Pensioner’s Organization. This convention decides the following programme of action to be jointly performed by the pensioners to popularize the demands and to achieve the same. 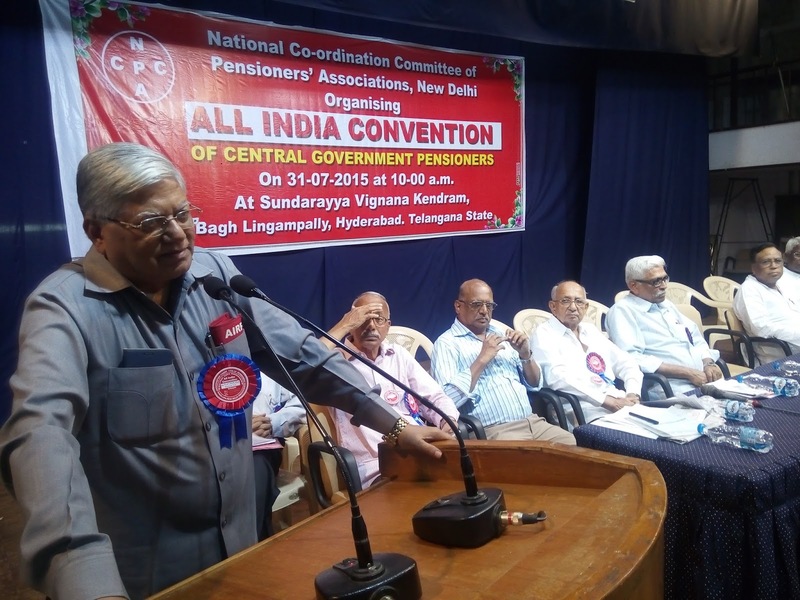 Since Central Government Employees have already embarked on a sustained struggle culminating in an indefinite strike in support of their demands, this convention decides the following programme of Action. 1. To popularize the demands as mentioned in the declaration through branch level/group meetings. 2. Organize campaign program throughout the country in the month of August/September, 2015. 3. 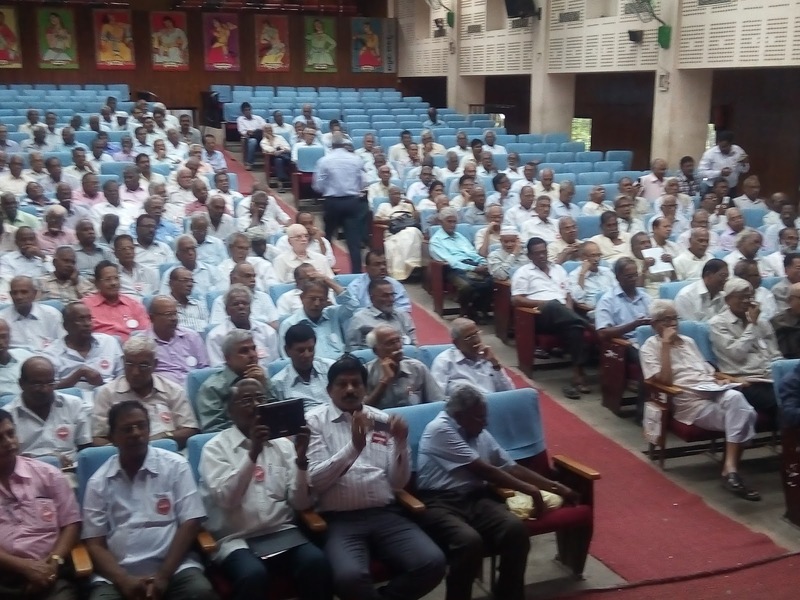 Organize district /taluk level conventions during 15th to 30th September,2015. 4. Organize joint massive Dharnas/Rallies when organized by the Central Government Employees at State. 5. Observe any type of Protest/Demands Day jointly with serving employee’s organizations and organize Dharna/Demonstration on the Strike days according to local situation.